WASHINGTON, September 14. /TASS/. 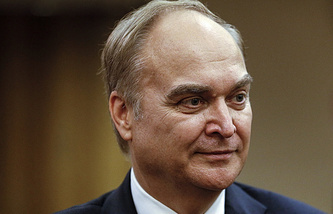 The Russian side is still waiting for the US response to its proposal of holding another round of consultations on strategic stability issues, Russia’s US ambassador, Anatoly Antonov, told reporters. "Being major nuclear powers and permanent members of the UN Security Council, Russia and the US share a special responsibility for preserving the international peace and security," Antonov said. "This task necessitates the resumption of full-fledged contacts in the military sphere, including the practice of joint meetings of US and Russian foreign policy and defense chiefs (the 2+2 format)." "We assume that a detailed dialogue on strategic stability and non-proliferation of WMD [weapons of mass destruction - TASS], traditionally conducted at the level of deputy foreign policy chiefs, should resume. Our readiness to engage in this kind of dialogue was confirmed in Helsinki, where the US side received practical proposals on the issues of arms control and disarmament. We expect Washington to shape its approaches to those issues in the near future, first of all to the key disarmament deals (New START and INF), the deployment of the global missile shield and the non-deployment of weapons in space," the ambassador continued. "We are awaiting for the US side’s positive response to holding another round of consultations on all those issues on the level of deputy foreign ministers," he said. The Russian-US talks on strategic stability have been traditionally co-chaired by Russian Deputy Foreign Minister Sergei Ryabkov and the US Under Secretary for Arms Control and International Security. Andrea Thompson was appointed to the post in April.